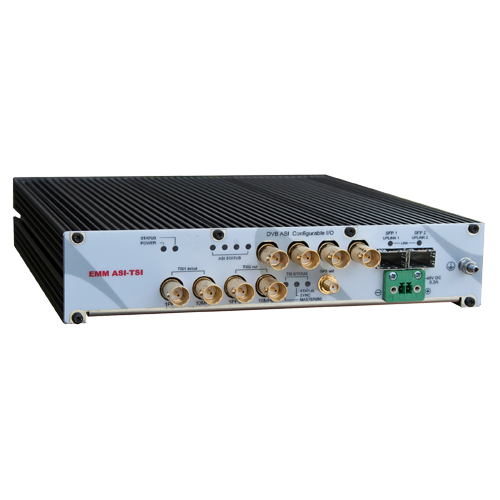 Optional External Multiplexer Module ASITSI (AT20103) with Timing Synchronization Interface (TSI) receives and transmits multiple HD video streams directly from broadcast equipment along with real time synchronization pulses (1PPS) and frequency reference signal 10MHz. With the built-in temperature stabilized oscillator (OCXO) the module delivers highly accurate signal to the remote link site and further redistribute the stable and jitter free 1PPS and 10MHz signal across the whole network – support of Single Frequency Network (SFN) infrastructure. The ASITSI (AT20103) EMM module accepts an external timing reference from timing sources such as GPS antenna or 1PPS input to deliver high precise and stable timing reference over WAVEFORM microwave radio links with an exceptional holdover functionality and offers additional interface ports to all range of OEM Modem Units. The system enables transport of HD video streams along with IP/Ethernet and data services over the same platform. Simple interconnection with OEM Modem Units is over fibre optics or metallic cable via dedicated SFP ports in EMM and Modem Unit. ASITSI (AT20103) EMM module is ready for branding and customization to OEM customers. Complete sort of accessories such as AC/DC Power supplies, cables, etc. are available to provide the turn-key system solution for our OEM customers.